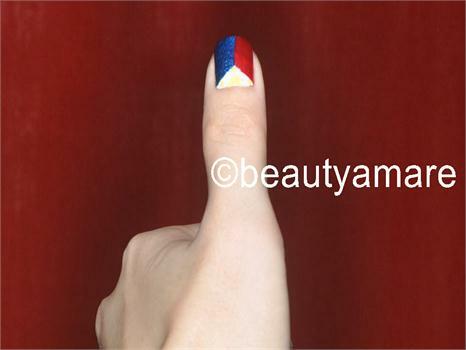 beautyamare: Philippine Flag Nail Art! + the Katipuneros' Inspired Nails! It's the National Heroes Day in Philippines, a commemoration of "the Cry of Balintawak" that happened around the year 1896. Basically, it started the Philippine Revolution against the Spanish regime and was popularly remembered as Katipuneros, led by Andres Bonifacio, tore up their CEDULAS or known as Community Tax Certificates. Well, that is how I remembered it being taught back in school. hahahahha... I was very serious with my studies back then. Moving on with this inspiration, the first thing that came up to my mind is the Philippine Flag and the old Katipunero flag having red rectangular cloth with 3 K's printed or back then embroidered on it. STEP 1. Get the necessary things a per below list. As advised in my previous tutorial, use a base coat to protect your natural nails and also to provide smooth nail canvass. STEP 2. 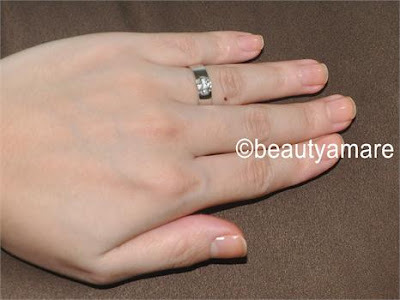 Paint your nails with white lacquer, either you paint the whole nails as shown in my pinky and ring finger or just one half of your nails near your cuticle as shown in the middle and pointing finger. Let it dry before doing the next step. STEP 3. 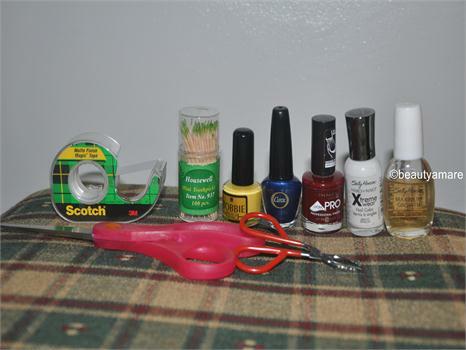 Get a scotch tape about an inch long and cut into small triangles. 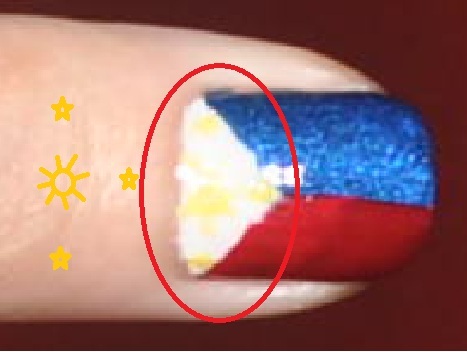 Just make sure that the triangles are enough to cover the width of your cuticles. This is to cover the white painted nails we did earlier. Quick Tip:stick the triangles a few times in your skin to remove some of the glue prior to placing in your nails; this will prevent the tape from picking up the white color once you remove it. STEP 5. Now the white portion is protected by the tape, you can now paint your nails with the blue and red lacquer. 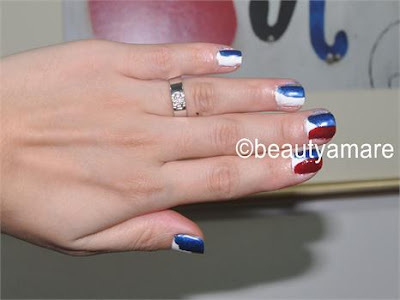 First, get the blue lacquer and paint your nails with a straight stroke in the middle. 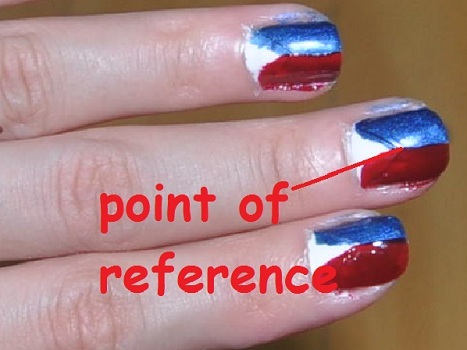 Your point of reference will be the tip of the triangle. Ensure to paint only the side of the blue color. The same instructions goes to the Red lacquer. STEP 5. 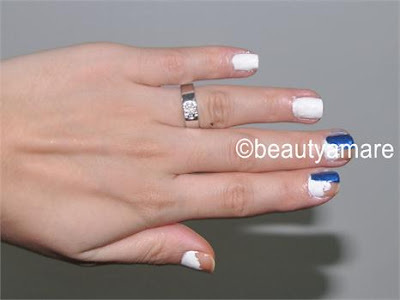 Once it dries, get your tweezers and remove the tape on top of the white lacquer. You should get the primary color and design of the Philippine flag without the 3 Stars and the Sun. STEP 6. Get your toothpick and yellow lacquer. Start creating 3 small stars and a sun on each nail by using dotting technique. Then you can start making small lines around the dot to create the illusion of star and sun. STEP 7. When it dries, you can now apply your top coat. The top coat presses on the lacquers and creates a soft and glossy finish to your nails. 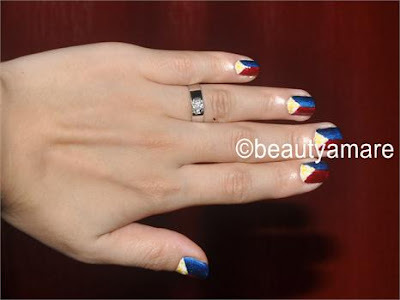 Since It was difficult for me to re-create the Philippine flag on my dominant hand, which is my right hand. I decided to create a new design, the Katipunero's Flag. To re-create this design, just follow the steps below. STEP 1. Paint all your nails red and let it dry for 10 minutes. STEP 2. Get your dotting tool or toothpick and just right the letter "K" on your Index, middle and ring finger and let it dry. STEP 3. Again, Let it dry. Once it dries, you can now apply your top coat. Fashion and art are really great medium in expressing your ideas, passion and even sentiments. 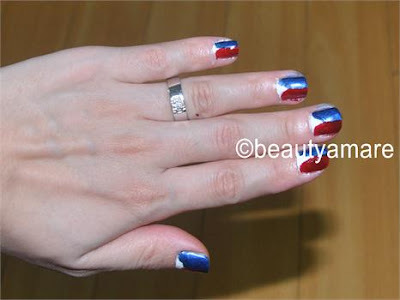 I am celebrating National Heroes day through my nails. Please keep on visiting us and we love to see your comments and your suggestions. Your blog has been accepted in PHILIPPINES a minute!